I loved these. Great colours and details. Ooh, vintage - my favourite! Hope I get one of these! Love those soft colours and the lace, mmm. 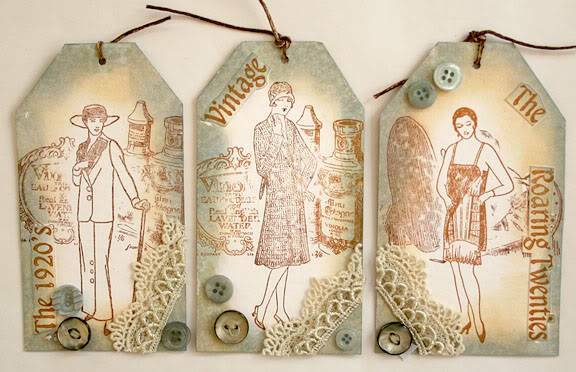 three old gals on three aged tags, very nice. Nice work Kim - love the vintage feel. Great vintage stuff Kim - I love em. Hopes were answered! I got the right-hand one, and it's beautiful. The colour is just slightly more a bluey-greeny irl - lovely shading - and lace and buttons really set it off. Love the waxed cord-type tie at the top - makes a great contrast and echoes the vintage theme. Kim also put another patterned paper on the reverse, one with a really vintagey feel. Nice tags, but not my colour tastes. hee hee, got the middle one and love it to bits especially the lace as you must have known i would drool over. Thanks Kim, its super. haha as i was making them i thought of you as i know you like the vintage stuff,glad you like them .